Thank you for keeping up with this blog, even through the dry spell of no recipes which has lasted for the greater part of this year. I have learned a lot and have experienced much personal growth in my nonfoodie life this year. Admittedly, my passion had waned for cooking and healthy eating during that time period. Seeing your comments come in day after day in spite of my absence has reminded me how wonderful you guys are. Seriously. Thank you for making these recipes, and for sharing your experiences with us all. I cannot keep up with the comments at this time (need to finish my college undergraduate career first), but I do read them all! I am so impressed with your alterations and suggestions for these recipes. It’s an honor that you take time to make my concoctions in this world of conveniently packaged insulin-spiking goodies. Honestly, I relied heavily on prepackaged junk food snacks during this past year. Am getting back to eating whole foods over this winter break, and am having so much more energy! 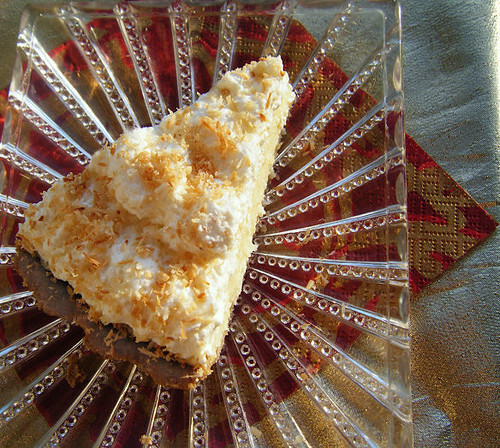 Per your requests, here is a delicious Healthy Coconut Cream Pie to celebrate the New Year! This pie is a bit higher in carbohydrates than some of my other recipes due to the inclusion of arrowroot starch. I made a couple of coconut cream pies without this ingredient, and they were so labor intensive that I decided to attempt a more traditional pie using a starch thickener. I aim to makes these recipes easy enough for y’all to whip up within a reasonable amount of time, so I took this shortcut. If you’d like a recipe without any starch thickener, let me know in the comments, and I’ll post the other one that worked well. Just be warned–the other recipe is not quick to make! You can use the crust from my Key Lime Pie if you liked that. The crust posted here is very sturdy, and has a definite nutty flavor. 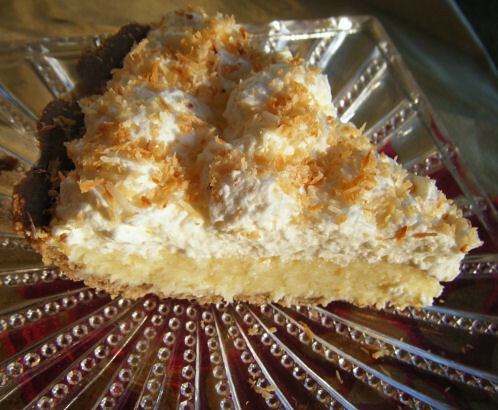 Both crusts are very easy to make, and go well with the coconut flavor of this pie. The Nutty Coconut crust is a bit higher in carbs, though. Preheat oven to 350 degrees Fahrenheit.Add all crust ingredients except butter to a food processor. Process mixture with short pulses, then process at high power until texture is very fine. Don’t worry if the mixture is a bit clumpy from the oils in the nuts and coconut heating up. Melt butter in microwave for a few seconds, then add to mixture. Mix together with a fork, then pat dough into a round ball. Press dough into the bottom of a 10 inch aluminum pie plate. Bake for 12 minutes. Place pie plate on a wire rack or pie stand and cool crust completely. In a small bowl, sprinkle gelatin over 1/4 cup cold water. Let gelatin mixture stand for 5 minutes. Separate the yolks from three large eggs, and add yolks to a bowl with vanilla extract. Slowly whisk arrowroot starch into yolks to make a thick paste. Keep whisking vigorously if it looks clumpy. Add coconut milk, erythritol, gelatin mixture, and salt to a sauce pan over medium heat. Bring to a boil for 3 minutes, stirring occasionally. Remove coconut milk mixture from the heat. Slowly add 1/4 of the hot coconut milk mixture to the egg yolk-arrowroot paste, whisking constantly. Add the entire milk-egg yolk mixture to saucepan, whisking constantly (do not stop stirring) until it starts to bubble again. This whole process should take about one minute, with the consistency rapidly changing to that of a thick pudding. Remove filling from heat and scrape into a bowl containing shredded coconut, stevia extract, and coconut extract. Mix all ingredients together quickly, and let filling stand for 15 minutes. Scrape filling into pie crust, and refrigerate 4 hours or overnight, covering the surface of the filling with plastic wrap (or a round of wax paper topped with plastic wrap, if you are wary of plastic touching your food). To toast unsweetened coconut, sprinkle it in an even layer over a cookie sheet. Bake for 7-10 minutes at 350 degrees Fahrenheit, stirring it around occasionally until golden brown. Watch it closely once it starts to brown! Once filling has cooled, add cream and sweetener to a bowl. Whip the cream with an electric mixer to stiff peaks. Beat in extracts and a pinch of xanthan gum (no more than 1/16th of a teaspoon) until mixed in. Scrape cream into a gallon sized plastic bag, twisting the top to loosely seal it and create a place to hold your makeshift piping bag. Snip off the corner of the bag and grip the top with both hands to pipe the cream around the border of the pie, working inwards in a concentric circle. Work quickly with a firm grip as you pipe the small “blobs” of cream. Sprinkle toasted coconut all over the top of the pie. These nutrition facts are rough estimations since I did not use the full amount of whipped cream to top the pie. I used roughly 2/3 of it. Yay! So happy to see this in my blog reader and nice to read an update. I'm going back to lower carb/whole food eating starting Monday (one more family celebration left on Sunday) and this sounds like something delicious for an occasional treat. Coconut goodies are the best! I will probably make it without a crust (mostly because I can't be bothered, lol!). Thanks for sharing!! Lauren, thank you so much. I'm also recommitting to eating properly in the new year. I can't tell you how grateful I am that your recipes have stayed available. That seriously looks like the best coconut pie ever! I'm sure with your cooking it is 🙂 Good thing I'm not counting calories for my NewYear resolution but like Carla aiming for whole food lower carb with no processed sugar! thanks for posting the recipe!!!! I cannot wait to try this recipe and share with my low carb and diabetic friends on FB. Thanks for putting so much into your blog and recipes Lauren, it is truly appreciated. Lauren, I was soooo excited to see you posting a new recipe. I'm T2 diabetic and have found wheat-free recipes that avoid sucrose to be the most creative; tastiest; and best for keeping my bg low without medication. I also avoid honey but agave syrup doesn't raise my bg. I'm getting ready to explore it as a substitute. Good luck reading all those emails! That pie looks heavenly! I heard that if you use a "warming" agent, such an inulin along with erythritol, it helps neutralize the cooling sensation. I'm curious to try it! That pie looks heavenly! I heard that if you use a “warming” agent, such an inulin along with erythritol, it helps neutralize the cooling sensation. I'm curious to try it! Carla – Glad to hear you are getting back to whole foods eating, too. We can do it together! This pie would be great without a crust. Speedwell – best of luck eating healthy in the new year! So happy to hear you are enjoying the recipes. Selina – Whole foods eating sounds like a great New Year's resolution. Joan – Thank you SO much for sharing the recipe on facebook. Chris – It is great to hear that these gf and sucrose-free recipes help you regulate your BG without medication. That is very inspiring to hear! I haven't used agave much due to its questionable status in terms of how healthy it is, but I am interested in learning more about it. Thank you for your comment. Jenn – I haven't tried to combine any warming agents with erythritol, but that sounds like a technique worth exploring. 🙂 Thank you for sharing that. Hi, Lauren; *great* to see you posting still and again. I am surprised to see a total of 5 Tbsp of the arrowroot, I thought its thickening power to be greater than cornstarch so could use less…I'm thrilled to try this recipe though, perhaps as a set of individual "pies". Happy New Year to you! So nice to "see" you again – I know you've been a busy woman. This pie looks KILLER GOOD – as is the norm for all your goodies! GREAT to see you back my dear friend!! Thank you SO much for posting this. I have seriously missed your great food ideas. Being gluten free AND low carb is a real challenge so I have been using many of your recipes with great success. I sure hope to see more of you in 2011! I have the hardest time making healthy pies – either the crust does not set correctly, the consistency is wrong, or it just does not taste good. I can't wait to try this recipe – and I'm glad I found your blog! So in place of the arrowroot starch in this recipe you might consider using chia gel. It would thicken it like a pudding and would be a good source of ALA and wouldn't add a bunch of carbs. Also, it's taste neutral and would just add some texture that might be fun to go with the coconut. Will have to try this – maybe for Valentine's day! Thanks for all you do! This is so awesome Lauren! My mom, a sugar, carb lover and addict, asks for this dessert quite often. She usually resorts to buying a prepackaged, frozen dessert, full of ingredients I have never heard of before taking Chemistry. I have tapioca starch on hand, and I will try and alter it just a bit to make the necessary adjustments for this starch. This looks so good! Glad I found your blog. hi, i am new here…have you heard of "let's do lunch"? it's all about eating natural unprocessed foods…it's also no wheat or rice or really any grain except corn…check it out, you might like it…i am adding you to my blog roll, i hope thats ok…i wanna make sure i get all your good recipes!!! Looks absolutely yummy, Lauren!! Can't wait to try it! Nice to see you back! Hope you find the time to post more frequently. I've missed seeing your lovely creations! This pie sounds so delicious and looks it! All the best with your studies too. Wow! That pie looks incredible! thanks for the recipe! Lauren, I'd love to see the more time-intensive, lower-carb version of this pie. I'm thinking it will be perfect for my grandmother's 90th birthday. Thanks! I'm so excited you're back to blogging! I found your site while you were on a break, and have made a number of the recipes. I notice that you're using erythritol and stevia combined. What do you think of Truvia? Its such a sin to eat that! I made the pie the other day. Unfortunately, I had to throw it out, as I did not like it at all…tasted weird…I figured we are all honest here! I do appreciate so much your recipes though and have really liked some of the others. Not everyone has the same taste buds I guess! Thanks for your report, Anon! It should have tasted quite coconutty, like the high carb version. 🙂 Others have reported success, so perhaps check your ingredients or cooking method. RVcook – Ahh more friends from LCF! I will try to post more this year since I will be graduating soon. Thank so much for the comment love! LauraJane – I hope this pie works out well for you! It was certainly an experiment for me, but my family loved it. Jsprik – I had not heard of Let's Do Lunch until your comment, but I am looking into it now. Thank you for the add! Elaine – I will be trying the more labor intensive recipe once more. Thank you for reminding me. Please shoot me an email abut that as well. Madison Mom – Truvia is great in coffee! I don't use it in baking due to the cost, and because I like to control how much stevia I add to recipes separately from the erythritol. Let me know what you think of it, please. Looks amazing!! I cant wait to try this.. i love your blog SO much! I just found your site and I am in love with all of your recipe ideas…I wondered though…I have a lot of xylitol – can I use that in place of the erythritol in your recipes? Thanks so much. You've got another fan, for sure!